Each Premier Room offers generous living space and combines soft colours and natural materials with contemporary furnishings to ensure high standards of comfort and design. The spacious bathroom has modern vanity and revitalizing rain shower. Embrace the laid back resort lifestyle, with endless days relaxing by the pool on comfortable sun loungers or socialising at the swim-up bar. 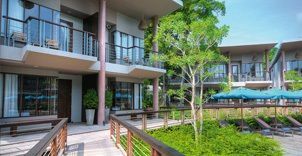 With a fitness centre overlooking the swimming pool and resort amenities located close by, the Hub Zone is the perfect choice for a family or group getaway.